Ivory, partly enamelled, with mounts of gold and copper alloy, and applied enamelled figures, and a pearl. The guns set into the sides of the ship are inset with diamonds backed with silver foil (some of these replaced by paste); diamonds (and replacement paste stones) have also been applied to the foot. Wealthy princes, nobles and scholars prized objects made from imported natural materials that were transformed into new forms by skilled carvers. They commissioned and collected such objects, displaying them according to the type of material in small rooms set aside for the purpose. 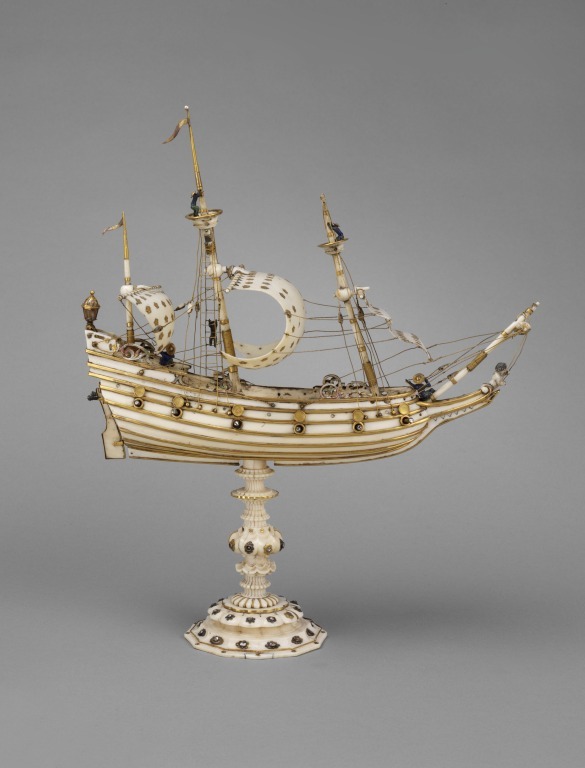 This ivory ship, made more precious by the addition of gold, diamonds and enamels, is a rare example of a highly-wrought object made of an imported natural material that would have appealed to such collectors. Nothing is known of the circumstances in which this model was commissioned. A similar, though larger, ivory and gold model frigate is preserved in the collections of the Dukes of Saxony, in the Green Vault at Dresden. The Dresden example (dated 1620) was made by Jacob Zeller for the Prince Elector Christian II of Saxony. The similarities between the two ships suggest the one now in the V&A may also have originated at Christian's court. This is a model of a three-masted ship, with ivory sails studded with gold stars. Gold stripes have been applied along the side and around the rudder, and 28 gold guns are inset, each with a rose-cut diamond with silver foil backing in the muzzle. Gold rigging, gilt copper alloy top masts, pennons and poop lantern provide further adornments. The rails are enamelled, and five blue-enamelled sailors with broad-brimmed gold hats can be seen climbing up the rigging. A female figurehead is positioned at the prow, and a small pearl is set at the tip of the mizzen mast. The body of the ship is hollow, chequered holes on the deck suggesting shutters. 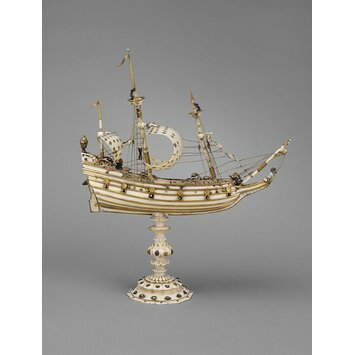 The ship is mounted on a stand consisting of a two-sided turned ivory stem on a twelve sided foot, with copper alloy mounts. This is a model of a three-masted ship, with ivory sails studded with gold stars. Nothing is known of the circumstances in which this precious model was commissioned. A similar, though larger, ivory and gold model frigate is preserved in the collections of the Dukes of Saxony, in the Green Vault at Dresden. The Dresden example (dated 1620) was made by Jacob Zeller for the Prince Elector Christian II of Saxony. The similarities between the two ships suggest the one now in the V&A may also have originated at Christian's court. Given by Dr W.L. Hildburgh F.S.A. in 1956; formerly on loan from Dr Hildburgh. Syndram, Dirk. Renaissance and Baroque Treasury Art: The Green Vault in Dresden. Translation by Daniel Kletke. Dresden, Staatliche Kunstsammlungen, Dresden / Deutscher Kunstverlag, 2004. ISBN 3422065159.